Fifteen years after its expected lifespan, the Bonner Bridge is finally about to be replaced. They placed final connecting girder on the replacement project last week and if all goes a hoped, NCDOT is planning on a December ribbon cutting for the new bridge. The original Bonner Bridge connecting the northern Outer Banks with Hatteras island had an expected life expectancy of 40 years. Completed in 1963, the expectation was that a new bridge would be in place by 2003. But a series of vigorous environmental lawsuits—and a an originally preferred alternative that was cost prohibitive and would have made Pea Island National Wildlife Refuge virtually inaccessible—held up construction for move than a decade. The end result is truly spectacular, towering over the original bridge, it is an engineering marvel. The replacement bridge is only 20’, but it is so massive it seems much bigger. Whereas the current Bonner Bridge has one navigation span, the new bridge will have seven, all of them wider than the original. But what really seems to set this project apart is the application of the science of how to build a bridge in an environment as harsh and demanding as Oregon Inlet. To control corrosion, the rebar that is being used in the concrete girders and pilings is stainless steel, and it is the first bridge built in North Carolina that uses the material. The pilings that have to take the greatest weight have been pounded 100’ into the seabed of Oregon Inlet. The pilings are also at a slight angle, allowing them to handle more weight. There are other innovative design techniques as well, including material that creates a stronger but lighter concrete for the girders. The end result is a replacement span that is expected to have a 100 year lifespan. After completing the new Bonner Bridge the old one will have to be demolished, a project that will take almost a year. Plans call for 1000’ feet on the Hatteras Island side to be retained as a fishing pier. Much of the remaining material will be cleaned and used to create fishing reefs. 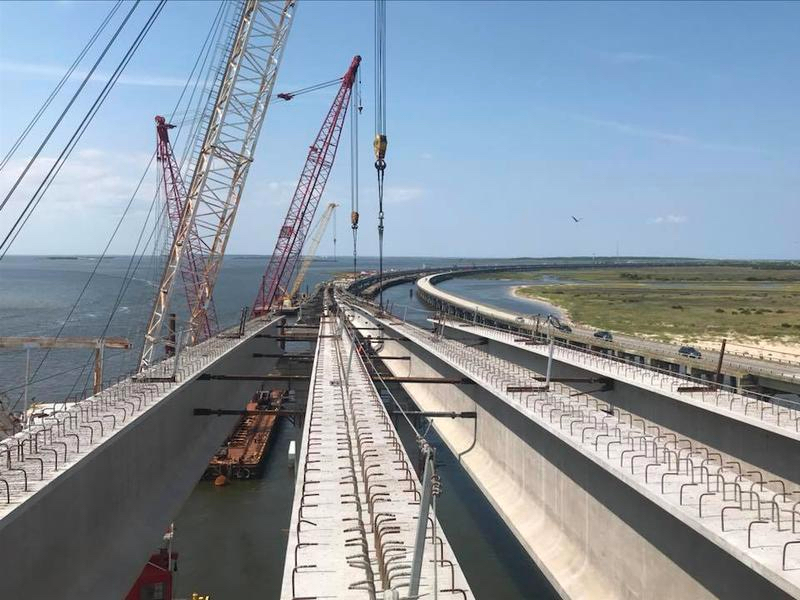 The Bonner Bridge is the most visible—and arguably important—part of the project, but NCDOT has always seen NC12 from Oregon Inlet to Rodanthe as a project area. The first bridge completed was the Richard Etheridge Bridge at New Inlet. The next bridge that will be the “Jug Handle” bypassing the S Curves north of Rodanthe. So named because it forms a jug handle as it swings through Pamlico Sound, NCDOT expect the project to be completed in fall of 2020. Fall is a great time to visit the Outer Banks. Check out our Joe Lamb, Jr. & Associates listing and see what’s available.